Tikal city is the site of the one of the largest urban centres from the classic period of Mayan Civilisation. While this is not the actual name and it was only given to the site of the ruins once they were discovered, the site nonetheless marks one of the capitals of the Mayan Kingdom at its peak. The grand architecture found in the ruins dates back to 4th century BC, but the city assumed its actual importance during the Mayan classic period. Tikal city became a site of agriculture as early as 1000BC and there was activity in the late pre-classic period. It had become an urban centre by around 400BC but there were other bigger cities around, including El Mirandor and Nakbe. In the 3rd century BC, Tikal dynasty was founded by Yax-Moch-Xoc, the first king of the dynasty. By the early classic period, it had become a fairly important city that was competing for power with the most powerful cities. It also benefited from the collapse of some cities during the late pre-classic period, notably El Mirandor. During the classic period, it became the largest urban centre in the region. Tikal city became a site of agriculture as early as 1000BC and there was activity in the late pre-classic period. In the classic era Tikal city was undoubtedly the most powerful urban centre in the region and became the capital of the Mayan Civilisation. However, during the 6th century AD, it entered in a long rivalry for dominance with Calakmul city and both cities formed a network of hostile alliances and fought frequent wars. During the 6th century, it lost a war against Calakmul and its power considerably declined. The endemic warfare in the region coupled with overpopulation and environmental changes brought about the downfall of Tikal around 900AD. The population of Tikal city during different eras varied from 10,000 to as much as 90,000 which can be considered the population of the city at its peak. The population peaked during the late classic period from 700AD to 830AD, after which it declined sharply. The population, just like other major cities, was divided into the ruling class and the commoners, with the former enjoying considerably more privileges. Religious themes were quite similar to earlier and later Mesoamerican cultures. The site of the ruins of Tikal city is located around 303 kilometres north of Guatemala City. It was at a distance of about 100 kilometres from its archrival, Calakmul, during the classic period. It covers an area of about 16 square kilometres and consists of about 3,000 structures. The ruins of the city are located in the rainforests of the northern Guatemala which was part of lowland Maya Civilisation. Tikal City is home to some of the most impressive buildings and architectural marvels of the Mayan Civilisation. The Great Plaza is at the centre of the city with two temple-pyramids on its east and west sides. In the south of the Great Plaza is the Central Acropolis which is a palace complex. Another important architectural site is the North Necropolis. There are a variety of other important temple-pyramids and public buildings that form part of the ruins. The layout of Tikal city followed a north-south axis when the Great Plaza and North Acropolis were built in around 250BC. This layout remained the same through the early and middle classic periods and was only altered in the 8th century AD when the east-west axis was followed in the construction of Temples I and II. In addition to impressive temple-pyramids, the city had two causeways, ten reservoirs of water, a market complex, palaces, and a triple ballcourt. Tikal dynasty was founded in 1st century AD with Yax Ehb’ Xook being the first ruler. The ruler of the city was considered the supreme authority and thought to have been descended from gods. However, there were also powerful councils consisting of the nobility who ran the government and made laws. Priests were also powerful figures since religion was supremely important and provided legitimacy to the rulers. Crimes like murder, arson, and blasphemy were punishable by death. Tikal city had a sophisticated system of water preservation and management because it did not have direct access to any water source. Water collected from rainwater was stored in 10 large water reservoirs. These reservoirs were a very efficient and reliable source of water. Even the archaeologist during the 20th century working on the site used one of these reservoirs in refurbished form for their own use. Trees were grown around the reservoirs to anchor the soil. 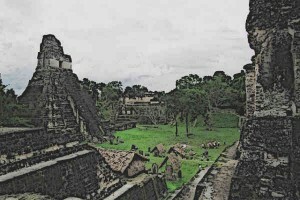 Different kinds of materials were used for the construction of different kinds of buildings in Tikal city. The houses of the commoners were made of mud walls with tree branches and leaves and other such materials acting as roofs. Houses of the nobility were made of stone and other sturdier materials. In the construction of pyramids, mica was imported from Brazil some 2,000 miles away. Mica acted as insulation for the walls. Pyramids were also often covered with stucco. Inhabitants of the Tikal city had a vibrant social life which was largely due to the importance of religion. Religious ceremonies and festivals were common feature of the social life at Tikal city. Additionally, they played a variety of games, most popular of which was the ballgame. The ballgame was the favourite game of the nobility, although everyone played it. Ceremonies of dancing and banquets were also part of the social life at Tikal. There were various noteworthy architectural complexes in the Tilak city. One of them most remarkable ones was the North Acropolis. According to the archaeological evidence, the first traces of human activity in this complex are from 800BC, but the first structures were not built until around 350BC. There are multiple pyramids, palaces, and royal tombs on the site. Tikal city was the most powerful city of the Mayan Civilisation during its classic period which extended over several hundred years. The city-state held the status as the capital of Mayan Civilisation, although there was some rivalry with other powerful cities. It lost a war against Calakmul in 6th century AD which triggered its decline as the most powerful city of Maya. It resurged during the 8th century but after 900AD the decline was continuous due to constant warfare, overpopulation, and scarcity of resources.